If you’re looking for a measure of the challenge that awaits, new orders for durable goods are a useful place to start. Durable goods are arguably at the front line of economic activity. Purchasing big-ticket items, like cars and aircraft, take some degree of confidence in the near-term economic outlook as well as one’s personal (or corporate) financial condition. In times of economic distress, delaying such purchases is tempting. You can always buy a car next month. With that in mind, the modest rise in new orders for durable goods in July was heartening. As many economic observers have noted, the fact that such measures of spending and consumption were no longer plummeting was good news. All the more so when July’s durable goods orders posted a tidy gain. Some pundits said this was evidence that an economic recovery of some magnitude was imminent. But as we said last month in the wake of the July durable goods report, climbing out of the hole will take longer than usual. And when we say hole, we mean it. 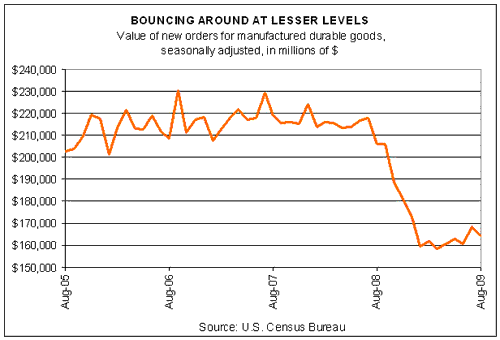 As the chart below reminds, new orders for durable goods are far below the levels that passed for normal previously. This is no isolated case. The charts look similar for a range of economic metrics, such as housing starts, industrial production and retail sales. Reparing this damage will take time, and government efforts to juice the economy won’t offer a quick fix, even if the data point du jour suggests otherwise at times. Indeed, after July’s pop in durable goods orders comes word this morning that new orders for durable goods slumped 2.4% in August. That’s hardly the end of the world, and in fact some corners of the report show growth last month–mostly in the primary metals sector. Nonetheless, today’s update reminds that there’s risk of expecting too much too soon at this point in the business cycle. Yes, recovery will come, but it won’t come easily or quickly. Ultimately, the requisite elixir is growth in the labor market. Unfortunately, there are precious little, if any, signs of a rebound on this front. That raises the question as to whether the green shoots of late are primarily due to the government’s monetary and fiscal stimulus? If the answer is yes, then we must turn to the more fundamental inquiry: When will the recovery begin that’s powered mostly by the internal dynamics of the marketplace? That too is coming, but timing is debatable. But if the crowd has jumped the gun with premature expectations of a true recovery, another round of repricing risk may be coming.